NASA Blue Marble image shows Arctic sea ice on September 23, 2018, when sea ice reached its minimum extent for the year. 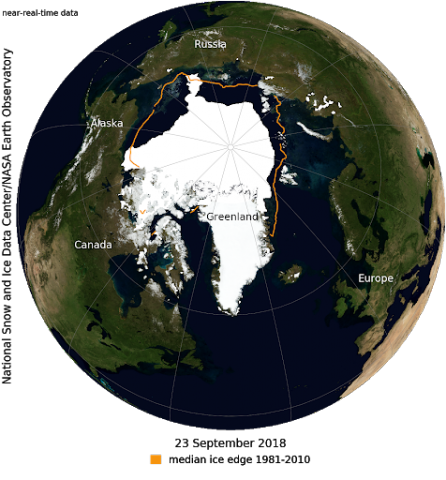 Arctic sea ice has most likely reached its minimum extent for the year, at 4.59 million square kilometers (1.77 million square miles) on September 19 and 23, according to scientists at the National Snow and Ice Data Center (NSIDC) at the University of Colorado Boulder. The 2018 minimum ties with 2008 and 2010 as the sixth lowest in the nearly 40-year satellite record. September 23 is the latest day in the year the Arctic sea minimum has occurred in the satellite record—observed this year and in 1997. After that, ice extent began to rise, signaling an end to the summer melt season. The 2018 minimum was nowhere near the record-low extent of 1.31 million square miles (3.39 million square kilometers) recorded on September 17, 2012, but it was nowhere near the 1981–2010 average, either. This year’s minimum extent ranked behind 2015 (fifth lowest), 2011 (fourth lowest), 2007 and 2016 (tied for second lowest), and 2012 (lowest). The twelve lowest extents in the satellite record have all occurred in the last twelve years. In response to the setting sun and falling temperatures, ice extent will begin expanding through autumn and winter. However, a shift in wind patterns or a period of late season melt could still push the ice extent lower. The Arctic sea ice extent number is preliminary—changing winds could still push the ice extent lower. NSIDC will issue a formal announcement at the beginning of October with full analysis of the possible causes behind this year’s ice conditions. The September 2018 observations continue a longer trend of Arctic sea ice decline. Sea ice extent in the Arctic is declining in all months, but the sharp declines in summertime ice extent are beginning to extend into the autumn freeze-up.